Are you Ready to Roll in Switzerland? The days are getting longer, temperatures are rising and there is something in the air. Do you feel the spring in your step too? It's time to get out of winter mode and into nature. Switzerland offers over 40,000 miles / 65,000 kilometers well-marked hiking trails to explore its diverse landscapes. Meet the locals and get treated to local specialities and insider stories, reflective of the rich culture and cuisine. Meet a Goatherd in the Bernese Alps. Located in the triangle between the cities of Bern, Fribourg and Thun, the Gantrisch is a diverse nature park covering 155 square mi / 402 square km. When hiking there, you get to see spectacular landscapes, wild animals and most likely Adrian Mäder. 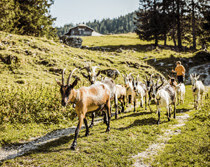 Aged just 13, Adrian Mäder is a devoted goatherd, who makes delicious goat’s cheese on Alp Bire – together with his parents. Those embarking on the Alp Birehubel circular hike can stop off at the farm and try the cheese for themselves at the family’s snack bar. For more info click here. Eat Cheese Close to Clouds in Ticino. Monte Generoso on Lake Lugano, reaches a height of 1,700 m / 7,755 feet. it offers breathtaking views of the Alps and Lake Lugano, Lake Varese and Lake Como. The “generous” mountain also offers a lot culturally: Many of the Alpine farmers, who live in old “rustici” (drystone houses skilfully built by hand) up here in summer, have been producing unique regional products for centuries, such as formaggini and zincarlin cheese. The two-hour circular hike on the mountain passes several of them. Enjoy!Round up. Get Cozy in a Mountain Hut in Valais. You want really off-the-radar, remote and rustic? How about a hike to the Turtmann Hut, located an hour from Sierre in the Valais mountains. In Summer, the valley is home to more cows than people. 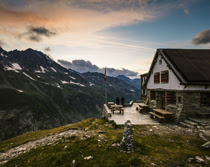 At a lofty 8,265 ft / 2,519 m the Turtmann Hut offers a cozy and comfortable stop for hikers and mountaineers. No matter what time you arrive, Magdalena and Fredy Tscherrig make sure you rest and get fed with a home-cooked meal. Make sure you try Magdalena's Black Forest gateau – it's to die for!